Have You Ever Wondered When Your Baby’s Teeth Will Come In? Deciduous Teeth or Primary Teeth are often also called baby teeth or milk teeth. This is the first set of teeth that humans get, and will be replaced with permanent teeth as the child gets older. Typically the first tooth erupts or “comes into the mouth” around the age of 6 months. This tooth is the lower central incisor. Children should have all 20 primary teeth by 3 years of age. However, some babies are born with a tooth already in the mouth. These are called natal teeth, and are not uncommon and are not a sign of any health problem. 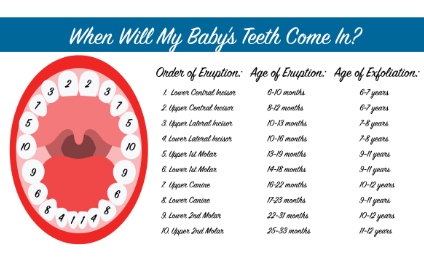 Primary teeth tend to follow an eruption pattern or order, but often do not follow a strict schedule. Usually, the tooth on the left and right will not come in at the exact same time. There is no preference to left or right side coming in sooner. However, they will usually come in shortly after one another. So When Do Babies Get Teeth? What to Do When Babies Get Teeth? Teething can be a rough time for parents, especially modern parents with a lot to deal with. For more info on teething, visit our blog. But don’t forget, it is recommended that children see a pediatric dentist at the time of eruption of their first tooth or by a year old, whichever comes first. Establishing a dental home is an important part of a healthy and happy developing child. If you have other questions besides “When Do Babies Get Teeth?” or if you want to schedule your babies first visit be sure to visit Coastal Pediatric Dental & Anesthesia.